Who doesn’t like sweet treats? 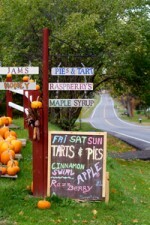 You can find yummy baked goods, ice cream, pies and cookies, jams and jellies, apples, peaches and strawberries, maple syrup and honey and fresh produce right here in Cayuga County on the Sweet Treat Trail Tasting Tour. I decided to investigate my own Tasting Tour on a cold March afternoon. The air was pungent with the mouth-watering fragrance of maple when my sister and I hit Smokey Hollow Maple Syrup, Pierce Road, Jordan. We spotted some wild turkey and a pond full of Canada geese on our way out. One field even had a flock of robins that had arrived perhaps a bit too early. 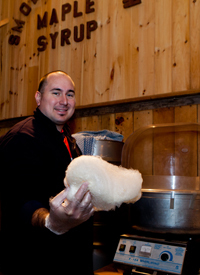 We were delighted by the fact-filled tour of the sugar shack and the great selection of maple syrup, sweet and hot mustard and candies in the small shop. While I was talking to owner Jim, Martha ate our entire bag of warm maple kettle corn, but Jim graciously gave me another bag to munch on – just for me. The Sweet Treat Trail Tasting Tour is a new opportunity to get out, drive a scenic country road or two and find some great food. I don’t know about you, but I enjoy a Sunday Afternoon Drive just like my family did in my childhood. Get out there and explore! Cayuga County is making it easy for you to find a car-full of tasty treats. With a kick-off on May 3 during Auburn’s First Friday and running through the summer until September 7 and 8 at TomatoFest, 27 Sweet Treat Trail members will greet visitors who are out and about on the Summer Tasting Tour. Pick up a tasting Tour Pass, visit 10 spots then drop it off at TomatoFest to win one of 3 baskets chock full of incredible edibles, gift certificates and award winning Finger Lakes wines. Farmers’ Markets are a perfect place to find a great selection of edibles. Cayuga County hosts 8 markets which pop up in small communities on different days. You might find colorful flowers, luscious strawberries, snappy peas, acorn or Hubbard squash and home-made breads plus crafts by local artists, music and even fresh farm eggs. It all depends upon the season. Most Farmers’ Markets start up about mid-June and run through the end of October. Cornell Cooperative Extension often offers cooking lessons and tasting at local Farmers’ Markets. This is a great opportunity to try something new grown in the Finger Lakes.